The Kent State Truth Tribunal (KSTT) was founded in 2010 upon the emergence of new forensic evidence regarding the May 4, 1970 Kent State massacre. KSTT is a non-governmental organization focused on revealing truth and bringing justice to Kent State victims and survivors. 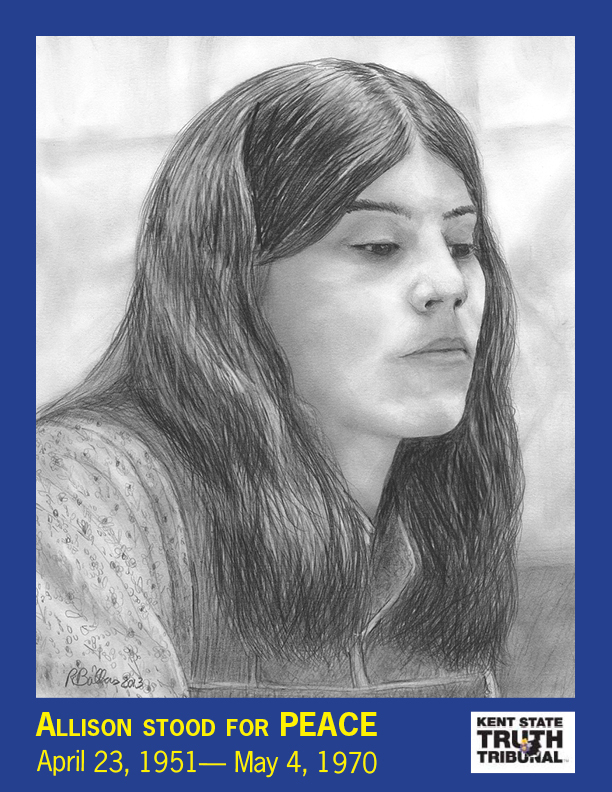 Representing Allison Beth Krause, 19-year-old student protester slain at Kent State University on May 4, 1970: Doris L. Krause, mother and Laurel Krause, sister. The Kent State Truth Tribunal seeks an independent, impartial investigation into the May 4th Kent State massacre (Article 2 (Right to remedy); Article 6 (Right to life); Article 19 (Right to freedom of expression); Article 21 (Right to peaceful assembly)). US military bullets silenced Allison Krause’s protest against the United States war in Vietnam and President Nixon’s announced escalation of the war into Cambodia. On May 4, 1970, Allison stood and died for peace. American leadership has exhibited a complete failure to conduct fair, credible, independent inquiries spanning back to the killing of peaceful student protesters in the Sixties and early Seventies at Orangeburg http://bit.ly/1h0qg8P for civil rights and at Kent State, Jackson State against the Vietnam war. At the heart of the killing of American protesters is the FBI, continuing to operate with absolutely no oversight nor accountability. We must redress the democracy-damaging inhumanities of Kent State and reclaim the possibility for American justice. Our call is for the protection of protesters in 2014 and for future generations to be able to know the truth of the 1970 Kent State massacre. 1) When will the United States institute an official, independent, impartial analysis into the new forensic evidence found in the Kent State tape? Seeking all opportunities for UN Human Rights Committee facilitation. 2) What action is the United States taking to ensure any reported excessive use of force, or other human rights violations in the context of peaceful protests, are investigated and prosecuted in a prompt, impartial and independent manner so the perpetrators may be held accountable?